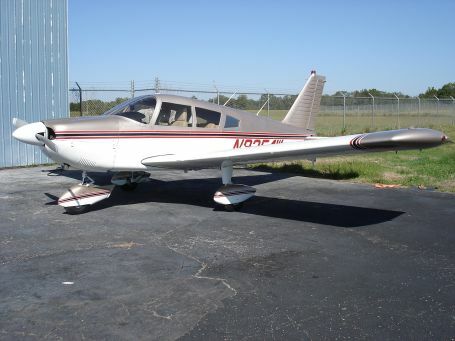 Here s N9354W, a 1968 Cherokee 235C. This is a very nice aircraft with decent paint. However, it looks like somebody had a crazy idea of doing a partial "rework" (if you could even call it that) of the interior. The side panels have been replaced with black automotive cardboard and reupholstered with a plaid material. The seats are factory original. Notice how the vinyl still looks pretty good, but the foam underneath has deteriorated to almost nothing. You really don't know back pain until you spend about 10 minutes in this pilot's seat. After flying the plane an hour, I walked like a neanderthal for the rest of the day. Totally stoved up, man. Hard to believe they actually put this stuff on the eyebrow too. I have no idea what the duct tape on the carpet is for, but the carpeting is Piper original. The best part about the whole interior is the headliner. Actually looks pretty decent for original equipment. However, it'll be removed and replaced with new. What you are about to see happen here, is a total transformation of the interior. The panel which has been painted countless times with stove pipe black will be gone forever. The side panels will get a one way ticket to the dumpster and be replaced with new panels fabricated from aluminum. We'll come out of this thing with fully refurbished interior in light tan leather. With everything removed, we'll start to clean it all down. The original glareshield was pretty deteriorated, so we'll rework that with some nice leather and add an eyebrow. Cleaned all of this down and removed what appears to be bathroom calk from the windshield. What a mess. Looking a little better now. I built a new later model eyebrow assembly in my mold and got it all padded and covered in black leather. Also, recovered the glareshield area in black leather and repainted the center window post. Now its alll cleaned up and ready for the windshield to sit back in. Got the headliner installed and the wall panels are pretty much in now. Should have the panel done soon. I'll be adding a digital clock, instrument bezel lighting, vertical card compass, and a 4-place intercom system. Here we have it all together. Installed all new cushion supports, all new solid core memory foam cushioning from our molds and all new leather. Gives it the later model seats without having to replace the entire unit. Even fabricated some custom floor mats to set it all off. Now I finally get to see what my new panel looks like. Quite a difference with the new metal panel and the new eyebrow assembly. I went ahead and added a vertical card compass which is really nice, and also a digital clock. Also installed instrument bezel lighting for better panel lighting at night and installed a digital outside air temperature gauge. And now here are some before & after shots. Hope you enjoyed this one. Thanks for visiting ! !